Saturday, September 29, 2018 11AM-3PM . Music; food trucks; fun! Free to the public. Vendor booths available for purchase. 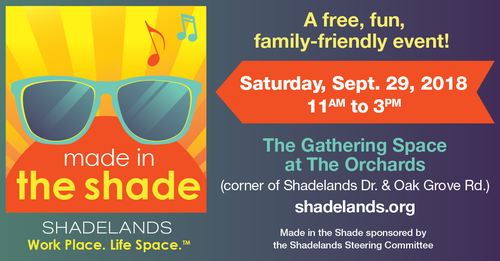 The purpose of Shadelands Made in the Shade Festival is to shine a spotlight on all the exciting businesses and amenities that make Shadelands the ideal work place and life space!